In the never ending quest to maximimize performance, one of the most overlooked parts are the final drive gears. 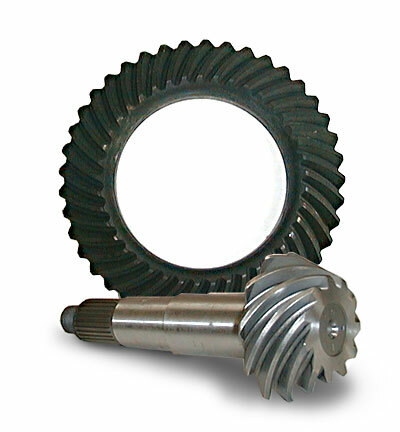 Also referred to as the ring and pinion, this simple 2 gear system converts the mechanical torque output of the engine, and emits it to the wheels. The higher that ratio, the more the torque is multiplied – at the expense of top speed per gear. Picking the right ring and pinion is a function of many things, such as the torque curve of the engine, the rpm range of the engine, the wheel and tire combination, and the vehicle weight, and how those all operate within the confines of your intended useage. A car that has a very high specific torque may opt for a lower overall final drive ratio, to help put it’s power to the ground without uselessly spinning the wheels. Vehicles that have exceptionally high rev limits and make comparitively less torque than they do horsepower may opt for a higher overall final drive ratio, which helps overall acceleration and general engine responsiveness. It’s the never-ending balancing act. In looking at what final drive is right for you, it’s often beneficial to examine what ratios other cars use. Will start this off by looking at the various final drive ratios of notoriously “quick/fast/powerful/desirable” Rear Wheel Drive Sports cars. If interested, we can expand this in future series to examine front wheel drive and AWD vehicles as well. If any of the figures below are incorrect, please let me know!